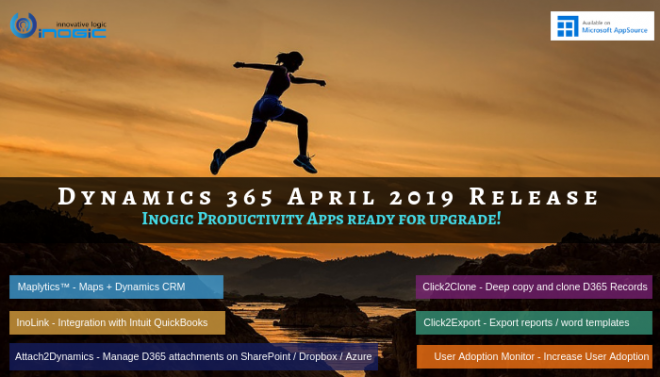 We have been popularily known as the clicks saving family 😉 .. after Click2Clone (One Click Solution to Clone your Dynamics 365 CRM records) and Click2Export (One Click Solution to Export your Dynamics 365 CRM reports and word templates using workflow). It was time to work on our next assignment to save clicks. We have been often reading about users complaining on the clicks and time they spend to upload documents to CRM retrieving, managing was another challenge. We have been used to managing documents the Windows Explorer Way. Not just this, users also wanted flexibility and more cloud storage options. Interesting, right! And that was obviously our next idea for Productivity App for Dynamics 365 CRM. We have been working on this for a while now and are happy to announce that “Attach2Dynamics” is our next new ISV solution that will help CRM users Drag, Drop single/multiple files/folders and manage their Dynamics 365 documents, the windows explorer way in systems like DropBox or SharePoint within their CRM. 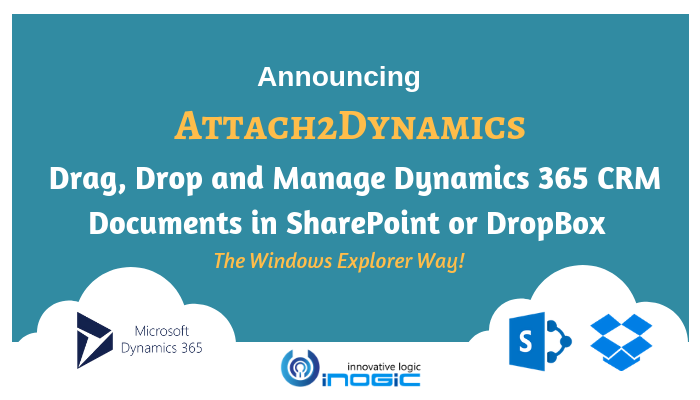 Attach2Dynamics currently supports two cloud storages – Dropbox and SharePoint. We are planning to incorporate Support for Azure Blob Storage, One Drive, Box and Google Drive Storages as well in the near future. We will be glad to get your recommendations in case you are using any other cloud storages that you may like us to include in our solution. Also, it supports all types of entities, records, and documents. There is no native integration of Dropbox storage system available within Dynamics 365 CRM. Let’s have a look at the various features and functionalities that are added to the solution. In the screen shot above you can see two tabs as SharePoint and DropBox so user has flexibility to choose cloud storage from where they would like to download documents using our solution within Dynamics CRM. Bulk download is also possible for downloading multiple documents in a single instance. This helps the user to save both clicks and time as they don’t need to navigate externally to their required cloud storage. Attach2Dynamics provides a native integration platform for users of various connectors within CRM. User now has the option to rename documents (files and folders) by selecting the required document of Dropbox or SharePoint from within Dynamics CRM. Users can generate the Email with the selected document file as an Email Attachment and send it to the required user. Users can simply copy and paste the generated link for the selected document using this option when required to be sent outside the Dynamics CRM. Users can create folder for both the storage systems using Attach2Dynamics. User can upload single as well as multiple files and folders using our solution by choosing the required document storage system. The user gets user-friendly UI to see the list of files uploaded on Dropbox or SharePoint against the current record. User can deep search for files/folders related to the entered keyword in the search tab and obtain all the documents with the search name in the enlisted file area. Deep search allows you to search for files or folders based on your current path. If you are currently in a “/A.Datum/Sample” path and if there are more folders/files in that path and if you search for something, then it’ll go till the last file and folder and will return results. 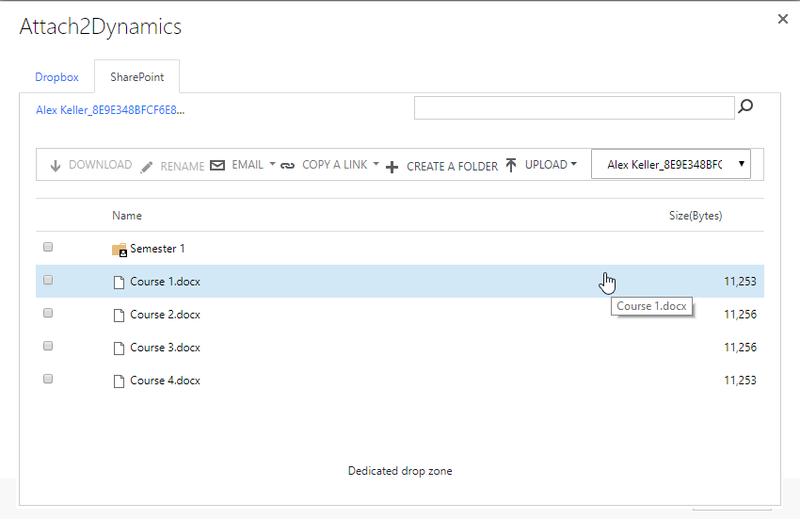 User can drag and drop multiple files and folders at one time to Dropbox and SharePoint from Dynamics CRM. User can move Dynamics CRM notes attachments to Dropbox or SharePoint. This option is unavailable by default for both Dropbox and SharePoint within the CRM. For the configured entities, this feature will move the notes attached to the enabled connector and after the successful migration of the attachment, it’ll leave a path back in the notes body for the users to know the migrated path. With the help of this option, users can get a suitable path for the SharePoint storage system. In case of SharePoint, there are chances that a record has more than one Document Locations, in that case, it enables CRM user to select the exact location where you want to upload the file. So its time once again to save those clicks with our Attach2Dynamics. Visit our Website for more about this clicks saving tool 🙂 or feel free to email us on crm@inogic.com for a Live Demo!